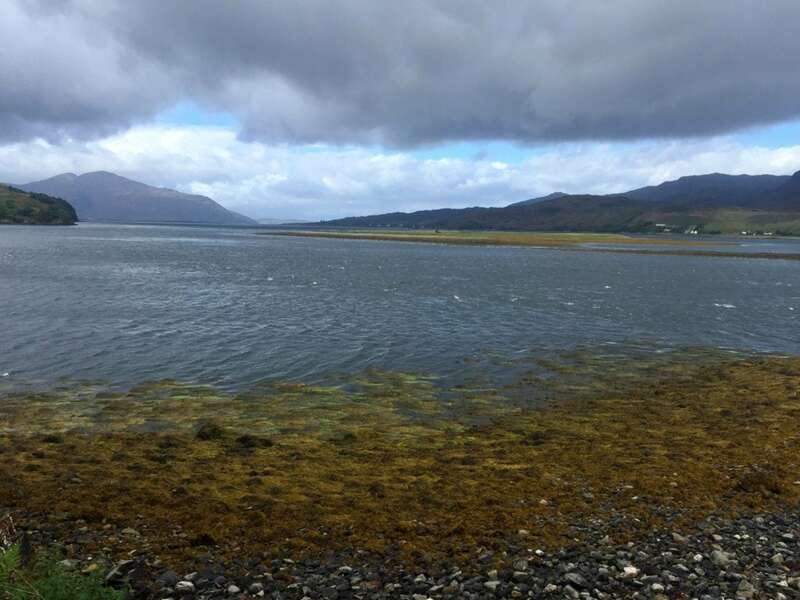 You may have heard of the Scottish song “Over the Sea to Skye”? It is about Bonnie Prince Charlie’s escape to Isle of Skye in a small boat after his defeat at the Battle of Culloden in 1746. Well, I was looking forward to the 120-mile drive from Loch Ness / Inverness to Isle of Skye because I had heard it was very scenic. We also planned to stop to visit Eileen Donan Castle, which is the most photographed castle in Scotland. There was rain in the forecast, but luckily we had some pockets of nice weather. And even when the weather wasn’t great, the clouds added to the Skye scenery. 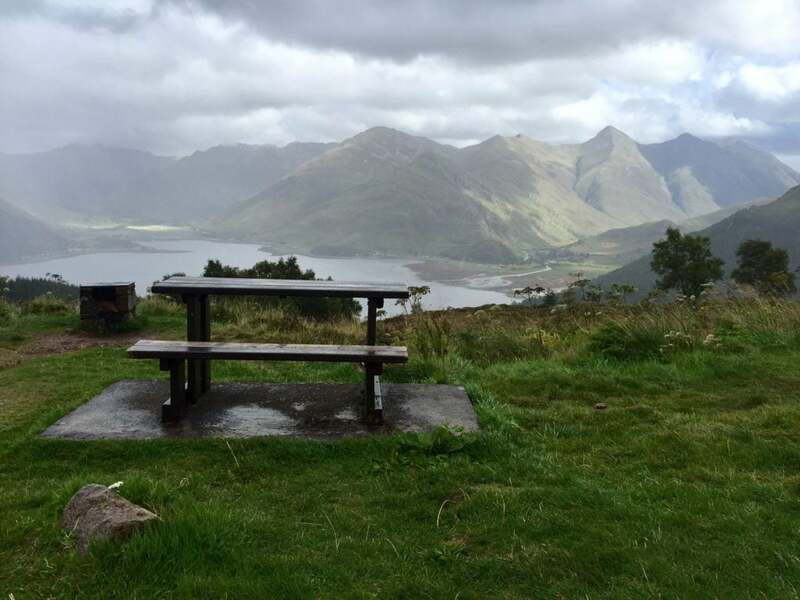 We spotted this picture perfect picnic place on our way back. 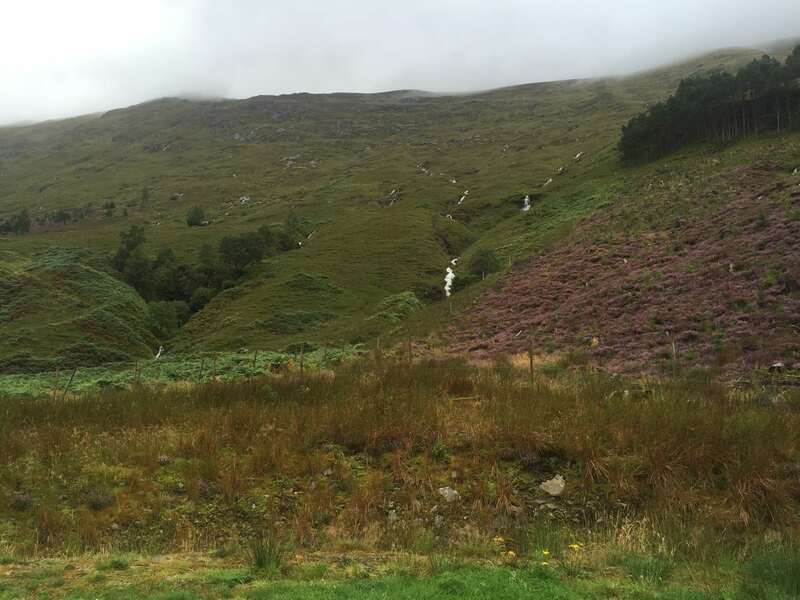 While I expected the trip to Skye would be scenic, I wasn’t expecting to see so many waterfalls. The mountains were so majestic and there weren’t too many other cars on the road. We stopped several times to take pictures, but there were times we wanted to stop but there just wasn’t room to stop the car. We were lucky we didn’t run into too many Scottish midges. From Inverness to Skye by car, it took us about 3 hours (not including the time we spent at Eileen Donan Castle). If you’re not up to the drive yourself, you can look into doing an Isle of Skye tour. I was surprised by how many waterfalls we saw! We could see Eileen Donan castle as we approached it. It is situated on an island where 3 lochs (Loch Duich, Loch Long and Loch Alsh) meet. It had been raining but remarkably stopped a minute or so after we got out of the car. Perfect timing for some pictures. Then we picked up our tickets and crossed the bridge to the island. The castle pretty much takes up the whole island, but I still wanted to explore outside while the rain had stopped. We walked around the outside of the castle and the views are lovely. You may have seen the castle before in a film or on television. It was in Highlander and the James Bond film The World is Not Enough, just to name a few. The castle is also very popular for weddings. They don’t have any really big rooms so they can only accommodate 90 guests for a ceremony inside the castle. The price for renting out the castle for a wedding is only £1500. Unfortunately, inside the castle, no photography is allowed. The first few rooms of the castle are dedicated to telling its story. The castle was first built in the 12th or 13th century possibly by King Alexander II or III as a defense against the Danes. There were several battles and the castle changed hands several times, similarly to what happened at Urquhart Castle. In 1719, most of the castle was destroyed in a battle between the Spanish and the Jacobites. You can see why Eileen Donan castle is the most photographed in Scotland. The castle lay in ruins, unoccupied for almost 200 years when it was purchased by John MacRae-Gilstrap. After 20 years of construction, the castle formally opened again in 1932. In 1952, John MacRae, the grandson of John MacRae Gilstrap opened the castle to the public. I have to say I was very impressed with the reconstruction job they did. You really feel like you are in a castle built in medieval times. The other rooms in the castle are decorated as they might have been when the castle was actually occupied. They are also filled with lots of impressive artifacts and mementos from the MacRae family. As you explore the rooms of the castle, be sure to look out the windows. The views of the surrounding areas are stunning. The view from Eileen Donan castle. One artifact that particularly caught my attention was a painting of Winston Churchill’s funeral by Terrence Cuneo. He was also the official artist of the coronation of Elizabeth II. The painting was a who’s who of the time including the royal family. There was a handy document that helped you figure out who the people were. I was also curious about how the painting got to the castle. I asked the staff and learned that the Lord Mayor James Miller of London was the grandfather of James Miller who married into the MacRae family. It was also interesting to learn that the Eilean Donan Castle has the only working portcullis in the Highlands. A portcullis is a heavy vertically-closing gate typically found in medieval fortifications, consisting of a latticed grille that slides down to seal off an entrance. Sometimes I think the clouds make an area even more scenic. After about an hour of exploring the castle, it was time to continue on our journey. To get to Isle of Skye you can either take a ferry or drive over the bridge. Going there we decided to take the Isle of Skye bridge so that we didn’t have to worry about getting tickets or the ferry schedule. Another positive about the bridge is that it is free. Once you cross the Skye bridge, your drive is not quite over. You still need about an hour on your Isle of Skye driving itinerary to get to Portree, the main town on the Isle of Skye. Getting around Skye can often take longer than expected because of the narrow roads. Leaving Isle of Skye, we decided to take the old ferry. Originally built in 1969, it is the only manual turntable ferry left in the world. I had never even heard of a turntable ferry but it is a boat that has something almost like a lazy susan on it that the crew can spin so that cars can get on and off. It is a small ferry, I think the maximum capacity is 6 cars and they pack them in. The Isle of Skye ferry costs £15 per vehicle. The road to the old ferry on Isle of Skye had stunning views and lots of waterfalls. The old ferry leaves from Kylerhea and goes to Glenelgs. The ride takes about five minutes to cross. While the ferry technically leaves every 20 minutes, we had to wait a little longer than that. The ferry was not full when we took it and there was a couple on it without a car. You can get out of your car for the brief crossing, as long as you can open your door. Russell had to climb over and get out on the passenger side. Our ride was very calm but I read that at peak tides it can be rough. Many people also spot wildlife on the crossing, but we didn’t see anything. The scenery is really beautiful though. 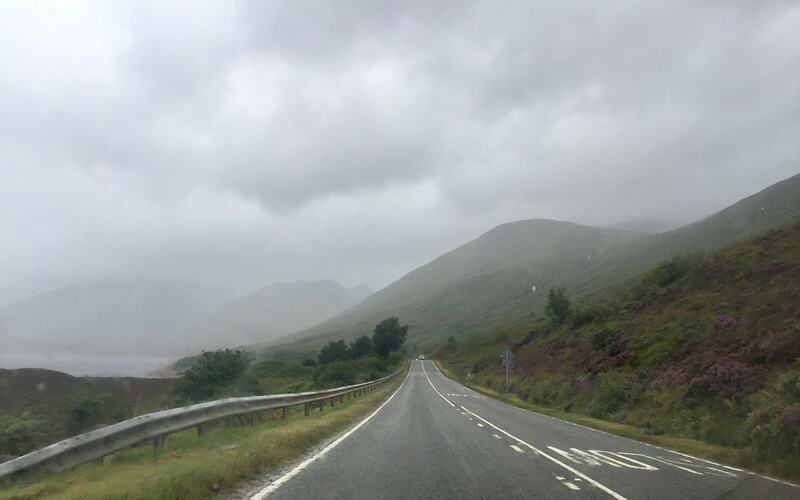 Not just on the ferry, but the road to Kylerhea and the road from Glenelgs were both beautiful. You can get a sense of it from watching the video below. So you know how they say to enjoy the journey, well, traveling from Loch Ness to Isle of Skye that is easy to do. Scotland has so much beautiful scenery and the Eileen Donan Castle is a fascinating place to explore. I hope this has given you the inspiration to visit Scotland. Have you driven to Isle of Skye? Do you know the Bonnie Prince Charlie Song? I would love to hear about it or other scenic roads. 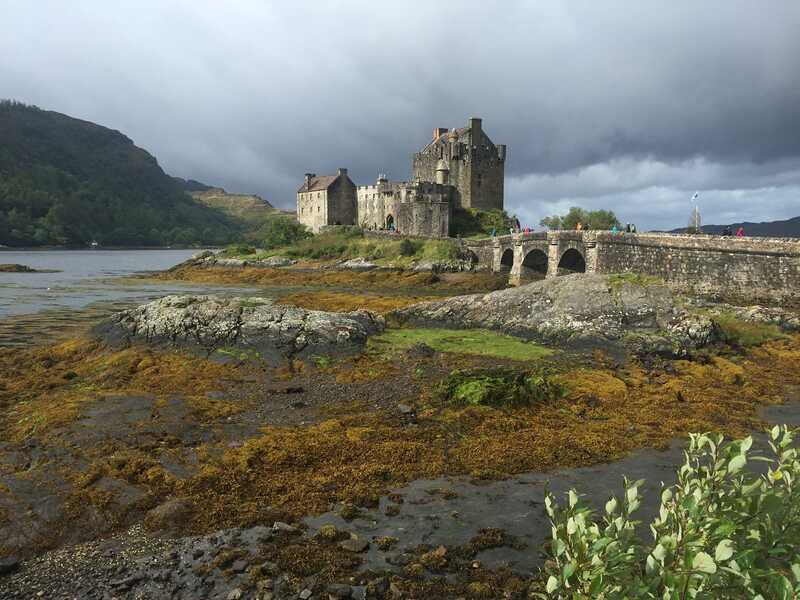 Make a stop at Eilean Donan Castle on your way to Isle of Skye and enjoy the views of the landscape from the different rooms inside the castle. If you have time, try taking the old ferry between the Isle of Skye and Scotland. The Harry Potter Train is another way to experience the Scottish Highlands. Check out our post for more insight into driving in the UK. If you like Isle of Skye, you might also enjoy visiting the Isle of Muck. Disclosure: No financial compensation was received, but Eilean Donan Castle provided us with complimentary tickets. As always, opinions expressed here are my own. What a beautiful part of the world. I am so jealous of your photos of Eilean Donan Castle, every time we have been past it is either enshrouded in fog or bucketing with rain….maybe next time. I love that song, they are using it as the theme for the Outlander series…now if you love Scotland this is one to have a look for. Michele – Thank you! Yes we were lucky with the weather for the most part. I really love that castle and the area. Would love to go back! Will have to check out the Outlander series, thanks for the tip! It sounds as though I did a similar journey to you and I totally agree that its a gorgeous scenic drive and the mountains really are majestic! I drove past Eileen Donan castle but didn’t managed to capture such a nice photo as you so I bought a postcard, sadly I was also unable to go inside due to the time of day I was travelling so it was closed which is a shame; I would have loved to have seen the painting of Winston Churchill’s funeral. When I arrived on the Isle of Skye, it was one of my favourite places to visit in Scotland for its wild beauty, I am therefore looking forward to reading your next instalment! Awe Angie! So sorry to hear you missed Eilean Donan castle but glad you agree the drive is amazing. And yes I loved Isle of Skye and there will be much more to come on the blog. David – Thank you! Yes I highly recommend both Eilean Donan castle and Isle of Skye. Glad to hear you like castles because I have more of those coming up on the blog. Thanks so much Upeksha! I hope you make it to Isle of Skye. I really loved it there and yes will be blogging about it over the coming weeks. Stunning scenery. I don’t know much about Scotland in general, but the castles look incredibly majestic. How cool that you can get married at the Eileen Donan castle for such an affordable price! I have to imagine you’d have to book very far there in advance, though, yes? I love all the waterfalls and agree that I would not have expected to see so many of them during a drive like this. Beautiful! Emily – Thanks so much! I am not sure how long the waiting list is to get married. And yes I loved the waterfalls too. 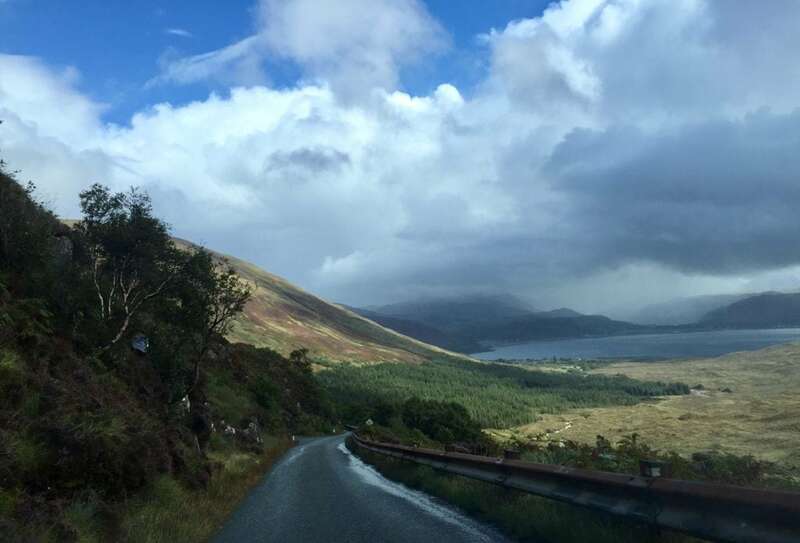 That is a lovely drive from Loch Ness to Skye – we did it a couple months ago and had such lovely weather – we were very fortunate! It doesn’t look like you visited the castle, but there are also some good views from the side (across the bridge) and also from some other viewpoints in the area – including one from the road above, the bridge (there is a pedestrian path), as well as the little store/rest area. Jessica – Glad you enjoyed it too and that’s great the weather cooperated. We did visit the castle and loved it. The landscapes are so scenic, indeed! The Eileen Donan Castle looks really cool from the outside. Bad they don´t let you take pics inside, must be awesome as well! Anna – Thanks so much. Yes I really loved the castle and the drive. I wish I could have shared more about it, but you are right the inside is fascinating too. Scotland is just as I remember it – beautiful and rainy. Love the picture of the castle and the video. Thanks so much Jurga! We really enjoyed our time there. Thanks Zoe! I want to visit more often too. It’s so beautiful and the people are just great plus I love all the castles and history! Yamuna – Thanks! Yes it is definitely something you must experience for yourself. Even the pictures don’t really do the drive justice. Great post. I have never been to Scotland before and would really like to. This was definitely inspiring. Thank so much Corinne. I did really enjoy my time in Scotland. Stay tuned more about it coming up on the blog. I am definitely adding Eilean Donan Castle to my bucket list! Absolutely stunning pictures! Thank you Leah! Yes, I definitely recommending visiting the castle and if you make it that far, you might as well visit Isle of Skye. You won’t be disappointed. So jealous! Love all of the pictures. We didn’t get to see this part of Scotland during our visit. The overcast skies in your pictures make everything look that much more mystical. Thanks Melissa. There really is so much to see in Scotland, I definitely plan on going back! Isle of Skye and Eilean Donan castle are definitely worth a visit. I wish we’d been able to make it to Skye on our trips to the UK, but no such luck yet. One day! 🙂 I really, really, really want to visit Eilean Donan castle–it’s on the bucket list! Natalie – Next time, I hope you get to visit that area! It really is just magical. More about it coming up on the blog. Sophie – Yes and it is even better in person. I highly recommend it. Lots more about my trip coming up on the blog. Tanja – Yes the area is amazing and I highly recommend visiting. This is something I have wanted to do for a long time and just haven’t had the time. I would probably go when you go because I love the moody skies. A lot of people don’t like to travel when it gets cooler or the weather changes – I think it makes for amazing photos and less crowds. Nicki – Yes you definitely need to go to Isle of Skye. It is amazing. We were there the first weekend of September. For the most part we got good weather, but there were a few storms. A few more posts about the trip are coming up so stay tuned! Scotland looks gorgeous and so romantic. And that castle looks like it comes out of a fairytale! I’d love to go there someday. Thanks Sara. Yes Scotland is wonderful and I hope you get the chance to visit. That is such a beautiful ride, and Eilean Donan Castle is one of my favorites. It’s just so stunning. Unfortunately we arrived 5 minutes after closing time on our drive through Scotland. Thanks! That’s too bad you just missed visiting the castle, but I guess that’s a good reason to go back. Thanks so much Ashley. I hope you get to visit Scotland! Skye also plays a role in Celtic mythology. I’d love to spend a day there. wonderful photos! Yes! Thanks Eileen. It really is a special place and I hope you get to visit. I love Scotland and would love to explore more of it! And I agree overcast skies really make for a more atmospheric shot! Stephanie – Thanks. I love it there too. I definitely want to go back! Thanks Sarah, yes Its a beautiful spot. I hope you get to visit soon! Karen – Thanks so much! Yes, I would love to see puffins too! Wow this post has so much useful information and so many good tips! Thank you for sharing. Your photos look so beautiful and scenic. It’s a shame about not being allowed to take photos inside the castle but I guess it is a good reason for a visit! Thanks Katie, glad you enjoyed the post. Yes, you should try to visit the area, you won’t be disappointed. Thanks Christina. Glad to hear you enjoyed it. Beautiful photos! Loved the castle and gorgeous landscape, and agree – the clouds seem to add to the scenery. Glad you enjoyed your visit! Thanks Julie. Glad you enjoyed the post and hope you get to visit the area one day! I spent a few days on the magical Isle of Skye last year and loved it so much that I want to revisit someday. Enjoyed your post and photos. Thanks Ahila! Glad to hear you enjoyed Isle of Skye too. I would love to go back again too.